Private residential construction spending jumped 2.2% on a month-to-month basis during December 2012. The initial estimate of a 0.4% gain for November was moved up slightly to a 0.6% increase, but the October number was pushed appreciably higher from 1.3% to 3.2%. Spending has registered nine uninterrupted months of growth, as well as 16 of the last 17 months showing expansion. The nominal dollar level of spending has now reached its highest point since late 2008 and the average from the last three months is 32% above the cyclical low. Spending on new single-family homes decelerated to its slowest pace of month-to-month growth since the first quarter of 2012, rising 0.8% versus November. On a year-over-year basis, the nominal value of spending on new homes has risen over 28%. In addition, since bottoming out around the midway point of 2009, construction spending has surged 59%. The current NAHB forecast calls for single-family housing starts to expand for the entirety of the outlook period, but a slower pace of growth is anticipated during the first quarter of this year. They are expected to re-accelerate over the remainder of 2013, and thus we anticipate a similar pattern will likely occur for construction spending. 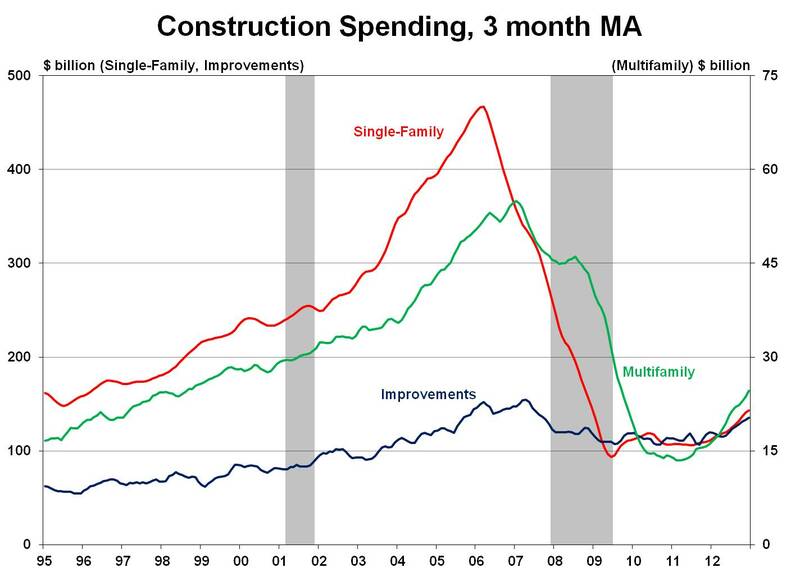 Construction spending on new multifamily projects jumped 6.2% during December 2012. Moreover, the initial estimate for November was revised higher from 0.5% to 1.8%, indicating spending activity finished the year strong. Of the three main categories of residential construction, multifamily has experienced the strongest rebound from its cyclical trough. Gains in spending have occurred in each of the last 15 months, with the latest month available representing the second largest percentage increase over this time period. On a year-over-year basis, the level of spending has skyrocketed more than 57% and has gained 97% from the bottom in August 2010. Remodeling activity improved in December as spending climbed 2.9% from the prior month. Preliminary estimates for October and November were also revised higher, significantly higher in the case of October with a 1.9% decline turning into a 2.3% gain. The 3-month moving average points to a solid upward trend in home improvement spending and closed out 2012 at its highest nominal dollar value since September 2007. NAHB’s Remodeling Market Index (RMI) has offered a similar judgment on recent home improvement activity as the current and future market indicators have achieved their best readings since the first quarter of 2004.